The hyoid bone is a ‘U’ shaped structure located in the anterior neck. It lies at the base of the mandible (approximately C3), where it acts as a site of attachment for the anterior neck muscles. 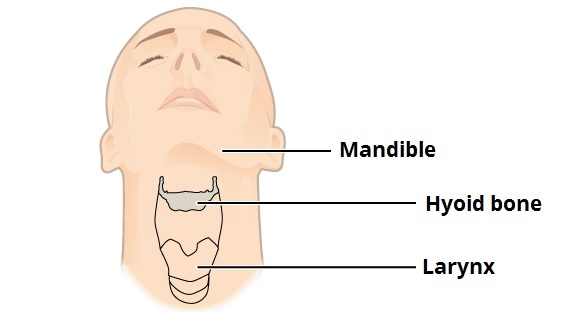 In this article, we shall look at the anatomical structure, muscular attachments and clinical relevance of the hyoid bone. Fig 1 – Position of the hyoid bone in the neck. 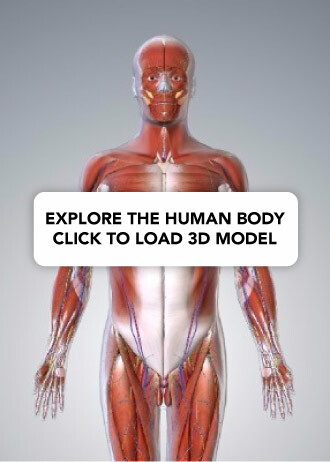 Body – the central part of the bone. It has an anterior convex surface and a concave posterior surface. Greater horn – projects from each end of the body in a posterior, superior and lateral direction. It acts as a site of attachment for numerous neck muscles. Lesser horn – arises from the superior aspect of the hyoid bone, near the origin of the greater horn. It projects superoposteriorly (toward the styloid process of the temporal bone). 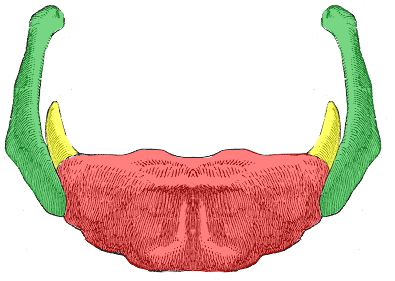 The stylohyoid ligament attaches to the apex of the lesser horn. Fig 2 – The major parts of the hyoid bone – body, greater horn and lesser horn. There are three main ligaments that attach to the hyoid bone – stylohyoid, thyrohyoid and hyoepiglottic. They act to support the position of the hyoid in the neck. Stylohyoid ligament – extends from the styloid process of the temporal bone to the lesser horn of the hyoid bone. Thyrohyoid membrane – originates from the superior border of the thyroid cartilage and attaches to the posterior surface of the hyoid bone and the greater horns. Hyoepiglottic ligament – connects the hyoid bone to the anterior aspect of the epiglottis. The hyoid is well protected by the mandible and cervical spine, so fractures are relatively rare. Hyoid bones fractures are characteristically associated with strangulation (found in approximately 1/3 of all homicides by strangulation). It is therefore a significant post-mortem finding. They can also occur as a result of trauma, with clinical features of pain on speaking, odynophagia and dyspnoea. Which part of the hyoid bone has been highlighted in red? Which of the following muscles does NOT attach to the hyoid bone? What is the role of the bony landmark highlighted in yellow?